Kitimat voters in the upcoming municipal election should carefully, very carefully, consider who are the best candidates that will, as much as humanly possible, produce a “world class” municipal mayor and council. Northwest Coast Energy News will not endorse any individual for mayor or council in the 2014 municipal election. 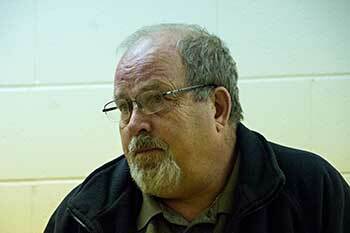 However, this election is probably the most important in the District’s history and so this editorial will outline the issues facing the District of Kitimat. When that council takes office in January 2015, it must have one item high on the agenda. Plan B. That’s B for Bust. In the past few days, just as the nomination process closed for municipal candidates, the world’s commodity markets began showing a sharp downturn and that commodity downturn will be a factor, like it or not, during the years that the new council will be in office. Why a “world class” council? The term “world class” has been bandied about a lot recently, especially by BC Premier Christy Clark and Prime Minister Stephen Harper. But that “world class” term has largely been political spin. For Clark it gives her government a hall pass if they decide, in the end, that Northern Gateway isn’t worth the trouble. For Stephen Harper, “world class” is nothing more than a propaganda term. 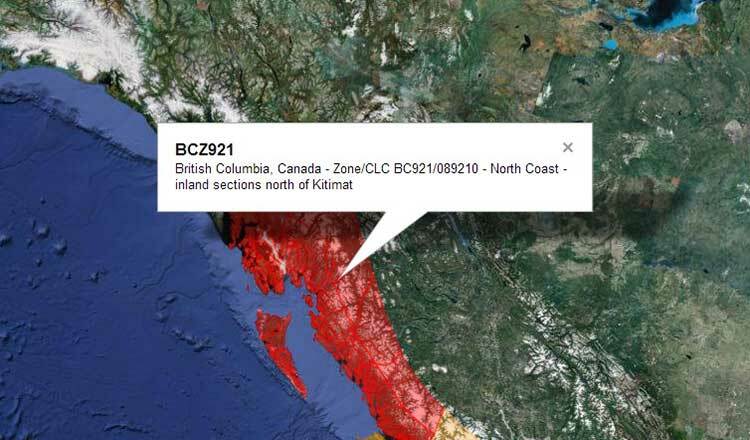 When it comes to Kitimat, however, it is wise to take the term “world class” seriously. How many small town councils have to deal with the world’s second largest corporation, Royal Dutch Shell, the twelth, Chevron and, if Glencore takes over Rio Tinto, the tenth? How many small town councils have to deal daily with federal and provincial governments, governments that while praising Kitimat for its potential really want to bury it by taking for themselves much of the advantages that industrial development could bring here? There is already one world class local council in the region, just down the road in Kitamaat Village, the Haisla Nation Council, which shows that with strong, intelligent and determined leadership, a small group can come out ahead in tough negotiations with giant transnational corporations and the governments. Yes, rights and title do give the Haisla Nation a negotiating and legal advantage, but a paper advantage is useless without vision and as Chief Counsellor Ellis Ross has said in interviews, the abiity to learn from mistakes and apply those lessons. We’ve heard people say that if Ellis Ross ever chose to run for mayor of Kitimat (which he wouldn’t because he is focused on improving the lives of the Haisla) he would win in a landslide. The present council has had a couple of major failures, both with the Northern Gateway project. The first was the failure to participate in any way with the Joint Review process. Council chose to be neutral, and stubbornly maintained that neutrality meant sitting out the entire Joint Review hearings rather than participating in such a way that the Kitimat was properly represented during the hearings without taking a stand one way or another. The Haisla intervenors ablely not only represented the interests of the Nation, by default the Haisla often represented the interests of the entire district before the JRP. The second was the plebisicite which had a convoluted question and protracted disageement on how the plebisicite should be managed. The question for voters is have those candidates for mayor and council who are part of the present adminstration shown a willingness to learn from those mistakes and do better in the next four years? Which candidates for mayor and council have the intelligence, determination and vision to quide Kitimat during the next four years. Which candidates have the negotiating saavy and yes (whether male or female) cojones to get the best deal for the District in the coming years? The big issue in this election, whether or not we are in a boom or a bust, is action to ensure that the residents of Kitimat have unimpeded access to the ocean for both casual recreation and for boaters. That means Kitimat needs a tough, determined council that is willing to really represent the residents in in the water access issue. When it comes to the Regional District’s actions on the sale of MK Marina, the District of Kitimat has acted like a wimp. The attitude seems to be well, Kitimat has only one vote on regional council and the rest of the region doesn’t really care, so there’s nothing we can do about it. 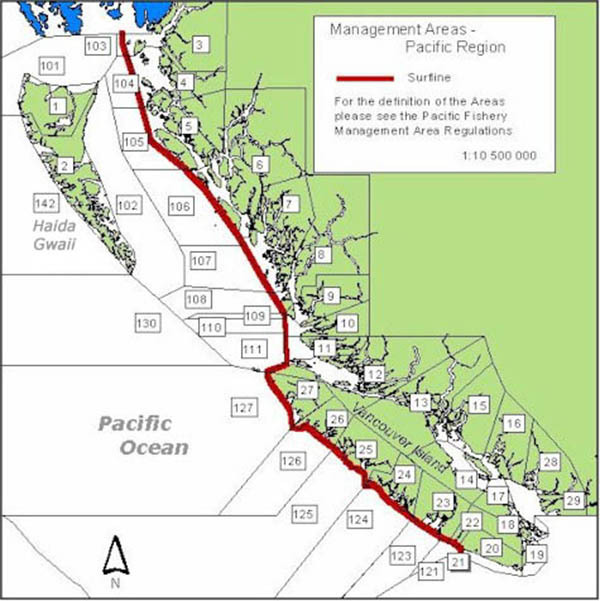 True leadership would be finding an imaginative way to make sure the interests of the people of Kitimat in gaining access to the ocean are not lost in regional council indifference. It also means that there must be better relations with the Haisla Nation and a way around the fact that Rio Tinto controls far too much of the waterfront. There’s also the long term problem that the federal government decreed two years ago, without consulting either the District or Rio Tinto, that the private port would become a public port. We’ve heard nothing about that since but the Harper government’s potential interference with the port of Kitimat cannot be ignored. That may mean hiring additional staff. This site has said time and time again the District needs its own in house staff city solicitor who can deal with all the issues that come up, rather than depending on occasional legal advice from a lawyer on retainer. If the district can hire smart planners and economic development officers, it should also bring back the position of “harbour master” which existed on paper some years ago and that way there would be one district staffer who could use that title (even if conflicts with the feds) to work full time on ocean access. One thing is certain, all members of the current District Council have had a huge work burden during the past three years, a work burden far beyond anything that is normal for a small municipal council in a town of 8,000 people. That work burden will likely increase during the next four years. Experience counts. Voters should ask which councillor and mayoral candidates have handled that work burden the best? Which of the candidates, new or old, are genuinely willing to take on that burden, which will range from negotiating (within the powers of a municipality) with some of the world’s giant corporations, many with a century of more of negotiating experience, while at the same time dealing with perennial issues like snow clearing in the winter, garbage collection during bear season and deciding which of Kitimat’s unique system of sidewalks need to be fixed this year? There are at least two positions on council that are up for grabs by new comer candidates. Who ever wins those positions will change the makeup of council, may even change the voting pattern (which during the current situation was often four to three one way or another, with Corrine Scott who is not running again, often, but not always, casting the deciding vote). So the voters should listen carefully and decide no matter what their position on all issues, who are the candidates that will strengthen the overall council. While we won’t know for certain until the debates, there appear to be a number of one issue candidates running, candidates that, it seems, want to refight both sides of the Northern Gateway plebisicite. Unless these candidates show a wider vision the voters should reject those candidates. On the “pro development” side there is a strange notion that if Kitimat could only elect a council that welcomes any industry, any time, then the world will beat a path to our door. That’s not only a fantasy, it’s a bad negotiating tactic as Christy Clark has found out. 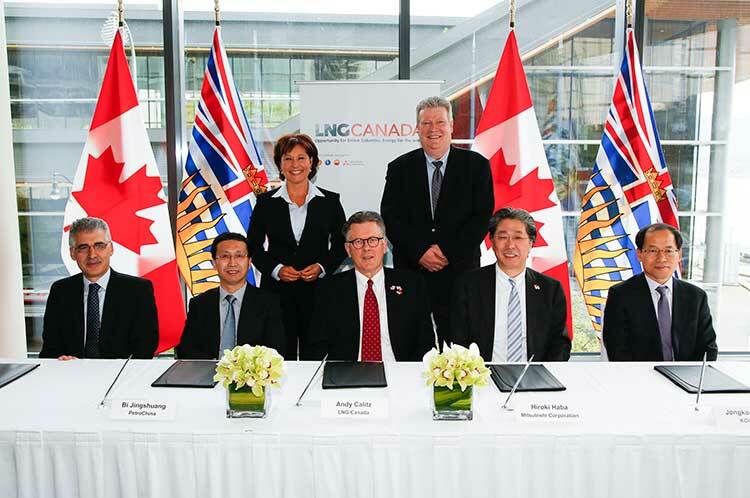 Clark in her provincial election campaign put all her political eggs in the LNG basket and (to mix metaphors) now the LNG industry is calling her cards and Clark has very little in the pot and a very weak hand. The big corporations would love a council that comes begging, cap in hand and will take any handouts the company may offer. Just look at Petronas and what it is demanding (not asking) from British Columbia. 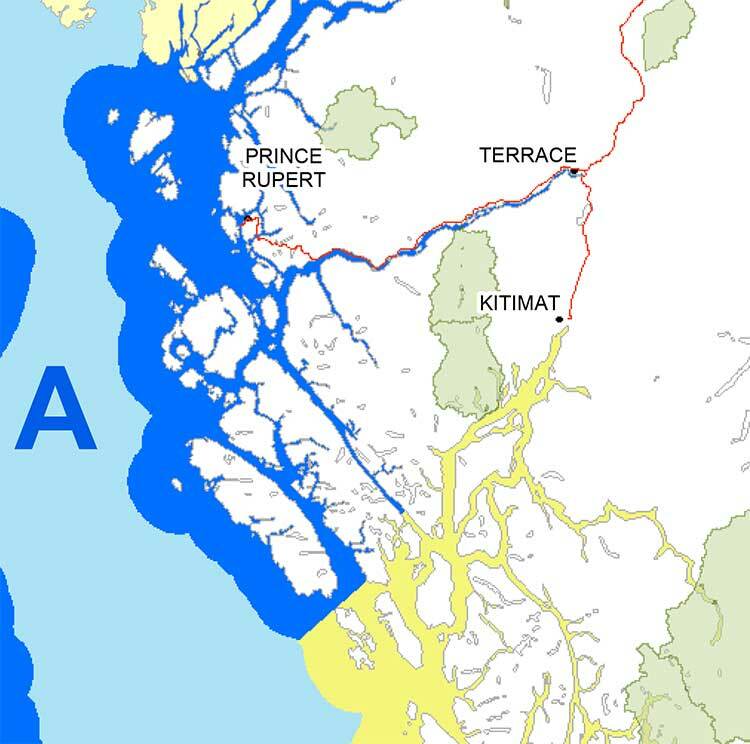 On the other hand, a candidate who is stubbornly on the environmental side is also a danger to the future of the district, since that candidate may also be an impedement to tough negotiations needed to protect the district’s environment including the Kitimat airshed, the Kitimat River and the Kitimat Arm. Electing a council that is unbalanced either on the pro development side or the pro environment side will solve nothing and will only increase the polarization in the community. Electing one issue candidates who care only about one side or the other energy debate while it may give some voters satisfaction, will likely mean that these candidates, if elected, will not be working hard on the day-to-day municipal issues like water, sewerage, snow clearing, how many books the library has or unraveling the recycling condundrum. So cast your ballot for those candidates best suited to take on the world, while at the same time making sure the sidewalks are safe. 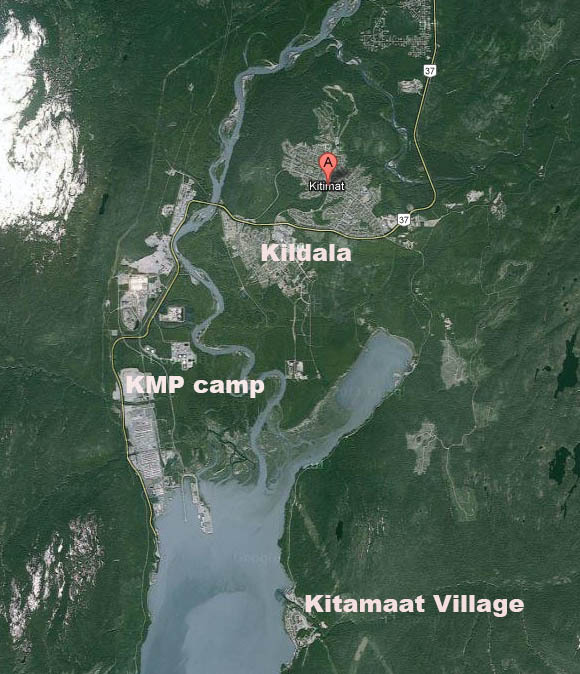 The Haisla Nation have purchased the old hospital site in downtown Kitimat from the BC government and are planning what will likely be a multi-million dollar development across from City Centre that will include a condominium-hotel, a new shopping mall and a restaurant. 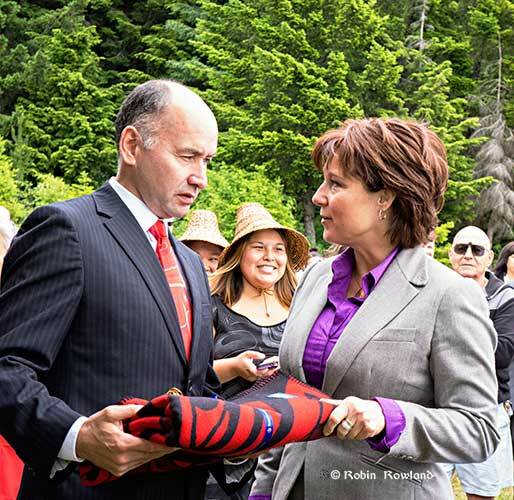 Premier Christy Clark came to Kitimat Tuesday to announce the sales agreement along with Haisla Nation Chief Counsellor Ellis Ross. The agreement also involves the District of Kitimat indicating the beginning of building a new phase in the sometimes strained relationship between the district council and the First Nation. On the day that the Conservative government approved the Northern Gateway pipeline project, all sides pointed to the hospital site agreement as an example of partnership that could lead to development of liquefied natural gas and other industrial projects in BC’s northwest. The old pink hospital, built when there were plans for a Kitimat with 50,000 people was closed in 2002 when the new Kitimat General Hospital was opened. The old building was dismantled and then imploded in 2005 at a cost of $1.9 million. Five years later, in 2010, the land was transferred from Northern Health to the province. 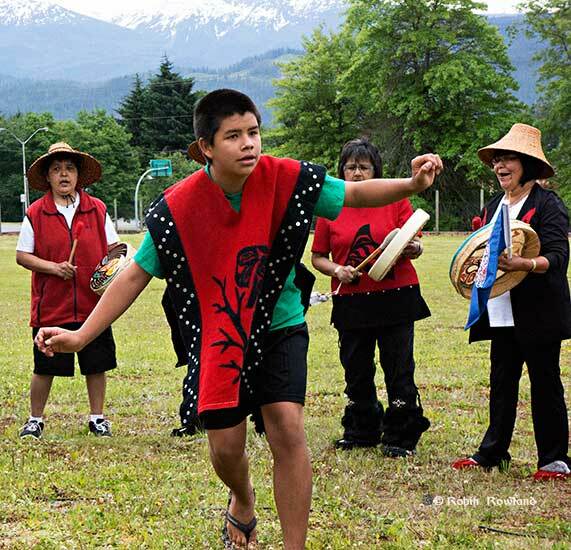 That began four years of negotiations with provincial ministries, the Haisla Nation and the District of Kitimat, so that the First Nation could purchase the land which is on their traditional territory. 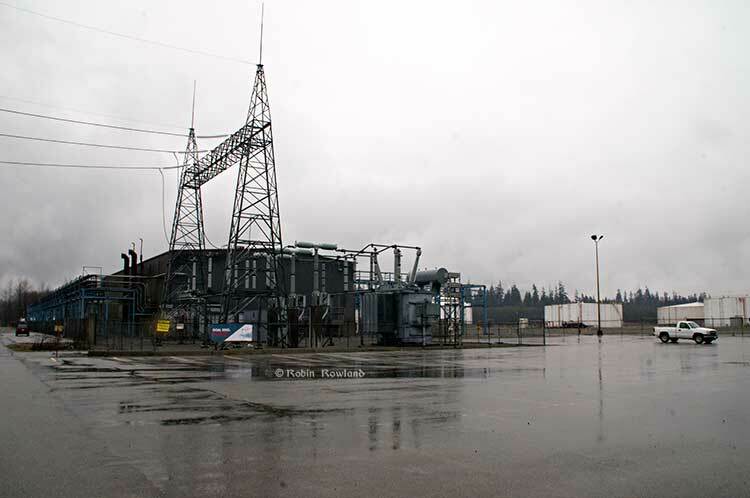 The land has sat idle since 2005, although it is prime real estate as the economy of Kitimat begins to boom with the growth of industrial projects like the $3.3 billion Rio Tinto Alcan Kitimat Modernization project at the aluminum smelter as wells the Shell-led LNG Canada and the Chevron-led Kitimat LNG projects. Both remarks were clearly intended to send a message to the federal government and Enbridge about consultations on the controversial Northern Gateway pipeline and tanker project. Clark concentrated on showing the connection between the land deal and future liquefied natural gas development. “There are over 13 LNG proposals for British Columbia, all of them are at various stages of developments and if anyone of those and we certainly hope it will be more than one reaches final investment decision, that is going to mean a lot of change,” Clark said. “This site is really about nation building, it’s about community building and it’s about partnerships. This transfer of land will enable the Haisla to commercially develop this piece of property and that is going to mean huge opportunities in this community. It’s going to open up economic growth. It’s going to be a big benefit for Kitimat and the entire surrounding region on this piece of land that has sat empty for far far too long. “We’re going to continue to work with the Haisla that have shown such vision and courage in leading the argument for LNG across this country and we want to make sure, as Ellis says that this property gets developed as soon as you possibly can. We’re very happy to work with the region of Kitimat, with industry with labour with First Nations to make sure we’re growing this opportunity for the future. “We’re here because this was the day that worked for everybody. If there is a message for the country is that liquefied natural gas is a nation building opportunity. Ground zero is right here in Kitimat, this community is going to build our country the way that energy has built the country in the past. We have the resources in British Columbia to create hundreds of thousands of jobs and prosperity for every Canadian. I really want Canadian to know that this is not just a BC project. It’s not just a northwest BC project. It’s all these projects that are of national importance. Ross did not put a cost on the project, since the first step is to do a survey for environmental remediation of the site. 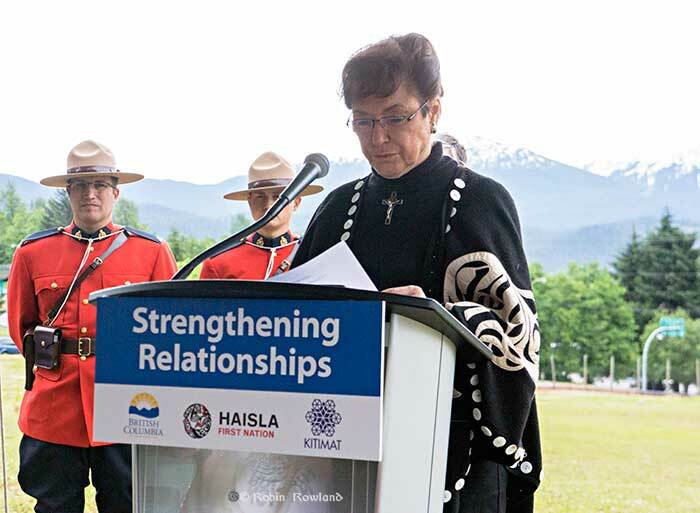 An agreement in April between the Haisla and the District of Kitimat on how the lands will be developed was hailed at the ceremony as a step in healing the sometimes strained relationship between the District and the First Nation. Ross praised the District of Kitimat for “their willingness to sit down and work with us,” adding that Tuesday’s agreement will lead to discussions on other issues. 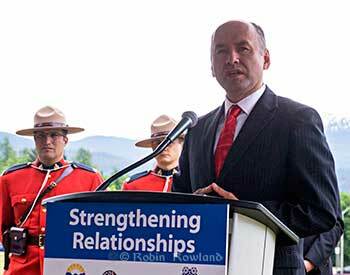 Ross said Tuesday’s agreement is “a small step but significant” step in making the Haisla Nation members “self-determining from the ground up,” so they can get jobs without being dependent on either the Haisla Nation Council or other levels of government. At the end of her speech, Clark deliberately brought up Northern Gateway, saying that “no heavy oil” project, including the Enbridge Northern Gateway, has met the province’s five conditions to proceed. Ross repeated that the Haisla are opposed to the Northern Gateway Project and that should the government’s decision approve the project, the next step is to go to court. He said that consultation by both the federal government and by Enbridge since the first contact in 2009 has been inadequate. Kitimat Mayor Joanne Monaghan has slammed Douglas Channel Watch for a “disrespectful” demonstration held during the ceremony that saw the transfer of land from the province of BC to the Haisla Nation. BC Premier Christy Clark came to Kitimat for the event. There were two groups of protesters across Haisla Boulevard from the transfer ceremony. While some were from Douglas Channel Watch, the vast majority were striking teachers. This was not respectful to the Haisla. This was one of the greatest moments in the government between the Hasila and DOK and all we could hear were blaring horns. How disrepectful and a shame on our community. It would have been so much more cultured if that could have waited for an hour until the ceremony was concluded. It was clear for reporters who went across Haisla Boulevard to cover the demonstration that teachers, who began a full-scale strike on Tuesday, far outnumbered the handful of Douglas Channel Watch demonstraters in front of the “Downtown Kitimat” sign. It was mostly the teachers who lined Haisla Boulevard and waved signs, encouraging passing traffic to honk in support. Most teachers continued to protest while some members of Douglas Channel Watch left the protest to attend the ceremony that marked the return of the old hospital lands to the Haisla Nation. As Northwest Coast Energy News reported Monday, as did the Douglas Channel Watch call for a demonstration, striking teachers had originally planned to rally at Centennial Park. 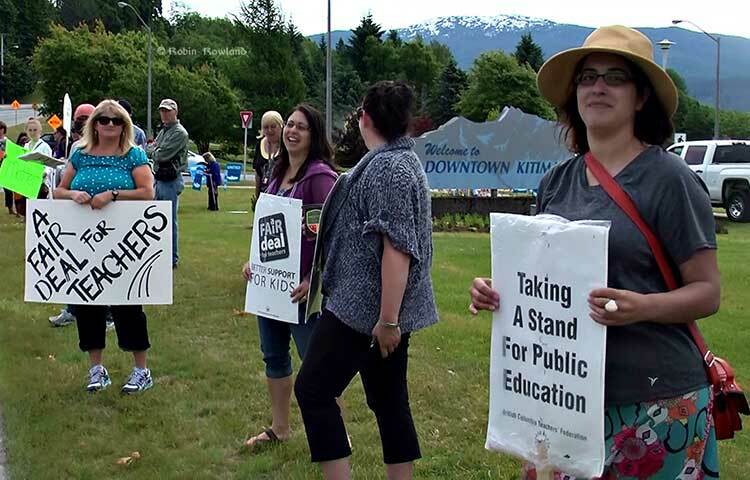 Reports on social media say the teachers changed their plans and moved the picket to Haisla Boulevard after the District turned on the sprinklers in the park. The active sprinklers in the park were clearly visible from the hospital site as the teachers lined the street and many passing vehicles honked. 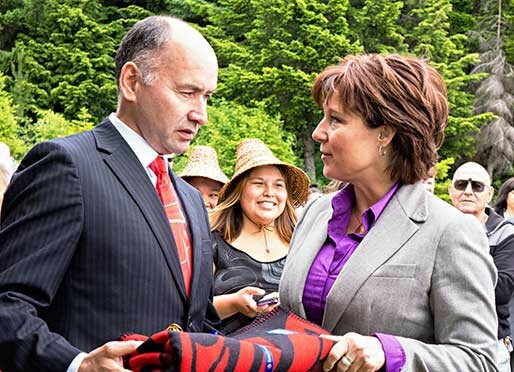 At least three rallies are planned for Kitimat on Tuesday, June 17, as BC Premier Christy Clark is scheduled to arrive to announce a new agreement with the Haisla Nation and, a few hours later, the Harper government will announce its decision on approving the Northern Gateway project. The Harper government is expected to approve the highly controversial pipeline, terminal and tanker project and once that happens, it is likely that Kitimat will be the focus of protests against (and perhaps for) Northern Gateway. District Council was told Monday, June 16, that the RCMP and District staff have had meetings to come up with contingency plans if large numbers of protesters come to Kitimat in the future. 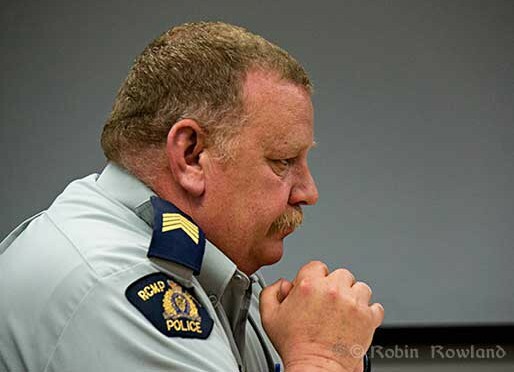 Answering a question from Councillor Phil Germuth, Staff Sergeant Phil Harrison, Kitimat detachment commander told Council that RCMP had met with Kitimat deputy chief administrative officer Warren Waycheshen to discuss the groups they were aware of that might be protesting in Kitimat. what we are going to do for garbage collection. all that kind of stuff,” the staff sergeant said. “Until we get more information regarding what kind of demonstration it’s going to be, it’s hard to plan for. We do encourage any leaders of any organization that’s going to be demonstrating to come and chat with us. “We’ve looked at the need for water, porta-potties, meals and stuff,” Waycheshen said. “It’s always tough until you know the numbers When they come in, are they going to be self sufficient or not? “Some of the suppliers say we should be able to get you this and that, but we will have to know at the time. It all starts on Tuesday when Premier Clark is scheduled to arrive at the old hospital site to announce the agreement with the Haisla. Douglas Channel Watch says it plans to rally at the “Downtown Kitimat” sign across the street from the hospital site at 10:45. 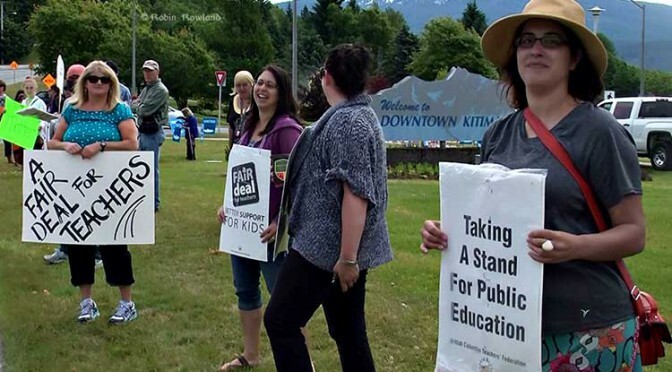 Kitimat’s teachers who will officially be on strike on Tuesday, plan their own rally at Centennial Park at the same time. The Harper government will announce its decision on the Northern Gateway shortly after 4 p.m. Eastern Time, after the market close in the east, 1 p.m, Pacific Time. Shortly after the government announcement, Douglas Channel Watch will then hold a second rally in Centennial Park. MP Nathan Cullen called the BC-Alberta framework agreement struck this morning regarding Enbridge “political window-dressing” that draws a blind on truth and transparency and deals a bust hand to British Columbia. “When it comes to the Enbridge Northern Gateway Pipeline, everything is negotiable for Christy Clark, including principals and promises made leading up to last May’s provincial election,” Cullen said. “The reality is that none of the five conditions Ms. Clark made such a big deal about 16 months as being necessary for Enbridge to put a pipeline through our province were even remotely addressed in today’s announcement. “The best we got after overnight negotiations and months of high drama is the ‘possibility of progress’ and a bizarre blessing that somehow allows BC to negotiate directly with Enbridge. “Today’s agreement does absolutely zero to protect BC’s environment and economy from a bitumen disaster,” Cullen said. “It’s a shameful political ploy that greases Ms. Clark’s real agenda, which is to pump oil through BC regardless of environmental or economic costs. Cullen noted Enbridge’s social licence to operate is clearly tied to safe oil transport, effective spill response, and First Nations consent, conditions on which today’s agreement is silent. Cullen vowed to continue fighting the Enbridge pipeline and to work toward sustainable resource development that is supported by Skeena-Bulkley Valley communities. The pollsters were the biggest losers in the British Columbia provincial election on May 14—but not in the way everyone is talking about. It’s clear to the Wednesday morning quarterbacks that the big issue in BC was the economy, and voters chose that economy over the environment. That’s where the pollsters failed and have failed time and time again for the past decade. As long as the pollsters keep asking the stupid question “What’s more important the environment or the economy?” a majority of voters, especially in uncertain times, will choose the economy. Politicians will campaign, as Christy Clark did brilliantly, by promising that there are better economic days ahead, putting the environment far down the priority list. By the time Canadians and all human beings realize that a viable economy is based on a sustainable environment it may be too late to save either. The Liberal majority under Christy Clark was a big surprise; the polling data indicated, at first, that there would be a big NDP majority and in the final days that the Adrian Dix and the NDP would sneak into the Legislature still in majority territory. Instead, Christy Clark, who until (if) she finds a seat, will be running the province as premier from the legislature galleries. The trouble is that the eastern establishment mainstream media are as out of touch as the pollsters. The Globe and Mail editorial, like most of the eastern media, once again sees British Columbia as nothing more than a junior partner in Confederation, existing to serve the interests of Alberta, with the concerns about our future secondary. It now falls to Ms. Clark, who was cagey about her position on the Trans Mountain project, to take an objective look at the proposal, let go of her populist, B.C.-first rhetoric, and ensure that her government is an open-minded partner with Alberta in its bid to get its oil to tidewaters for export. Any reviews of the pipeline project must be done quickly and with a deadline. There’s one big problem, a very big problem, with Clark’s promises. She opened her campaign in Kitimat by promising that the liquified natural gas developments will not only slay the deficit but pay down the BC provincial debt in 15 years. I asked Clark in the media scrum after her announcement how she could make such a prediction when the LNG market is so volatile. She replied that her predictions were based on very conservative estimates. That was spin. Clark based her election campaign on a promise that not only hopes to foretell the future for the next fifteen years but on liquifaction. Now liquifaction has two meanings. First is the freezing of natural gas to LNG. 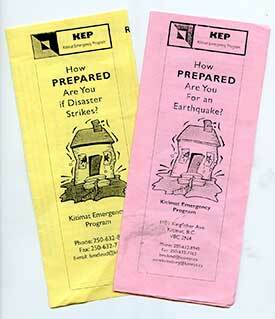 Second is the problem that occurs during an earthquake when water saturated ground turns into a liquid, bringing about the collapse of countless buildings with the death and injury that follows. 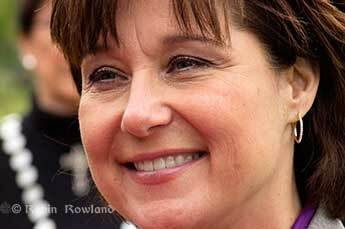 Clark based her campaign on the hope that the LNG market will not liquify—as in the second meaning. The LNG market looked so simple two years ago. Buy natural gas at low North American prices, pipeline it to the west coast, load it on tankers and sell it in Asia at the higher natural gas price there which is based on the price of oil. But, wait, the free market doesn’t work that way (sorry free enterprise coalition). Customers in Asia don’t want to pay the full oil-based price for natural gas if they can get it via the US Gulf ports at a cost plus North American price. If the export price of LNG falls, even if the BC projects proceed, the price will be a lot lower than Clark and the energy cheerleaders expect and there will be no new golden age for the BC economy. Changes in the LNG market are happening at warp speed and it is hard to keep up (And many people in Kitimat are trying to keep up with the daily volatility since the future of the town may depend on LNG). Unfortunately, the dying mainstream media failed to explain, even in the simplest terms, that Christy Clark’s LNG promises might be as empty as a mothballed tanker. This is one case where concentrating on the horse race—and the grossly inaccurate polls—was a blunder, when there should have been reality checks on the LNG promise. The conservative cheerleaders in the media actually didn’t do their readers much good when they failed as reporters to check out the real state of the energy industry or predicted economic catastrophe if there was an NDP victory. The NDP campaign under Adrian Dix was not up to its appointed task of explaining the need for both a viable economy and a sustainable environment. Most pundits point to Dix’s mid-campaign switch to opposing the Kinder Morgan pipeline expansion as the beginning of the NDP decline. More telling, for me, was Dix’s failure to explain the proposed two-year moratorium on fracking. There are lots of moratoriums and holds on fracking in North America and around the world. The Canadian media, however, failed miserably (if it even bothered to check) that fracking moratoriums are becoming a standard, although controversial, practice worldwide. A moratorium on fracking today is prudent given the uncertainty over current practices. Yes, fracking has been used for 50 years but on a much smaller scale. There are two new factors. First is the sheer volume of operations, with no idea what the massive increase in fracking will do to the environment, especially the ground water. Second is the stubborn refusal of companies to release proprietary information on the chemicals they use—the same “public be damned” attitude toward environmental concerns that has got pipeline companies in trouble as well. As Tyler Noble (formerly with CFTK News and now with the District of Kitimat) pointed out in a Facebook post, the electoral map shows perhaps the real story of the election. 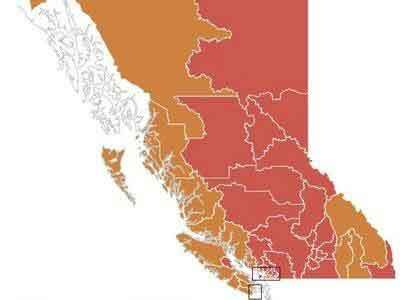 The British Columbia coast is entirely NDP orange. The Interior of BC went Liberal. The fight over tankers and pipelines is not going to go away with the result of this election, it’s going to get louder and a lot nastier. So the University of Calgary pundits, the conservative columnists and editorialists from Calgary to Toronto and the Globe and Mail editorial board will soon have to forget their cheers and go back to complaining about the BC peasants who have to be “educated” about how good pipelines are for the economy. The pollsters are now trying to find out what went wrong, and beginning to ask how to find out who will actually turn up at the voting booth? Even with the problems pollsters face with call display refusals, fewer landlines and the possible unreliability of internet panel polling, even with the flawed polling data some things are clear. Many older people, both on the left and the right are trapped in an obsolete world view of progressive views versus big business or the dreaded socialism versus free enterprise. Older people, worried about their economic future do vote and are often more small c conservative. Clark campaigned on that paradigm and she won. It may be that by the next federal election in 2015 and by the next BC election in 2017, there might be, it is hoped, a profound change in the political narrative. If the pollsters hadn’t asked that obsolete and stupid question about the environment verus the economy, business versus socialism, they might actually have had some good data in this election. The times, as Bob Dylan sang, they are a changing. The paradigm is shifting. In just the past few months there are hints of the rise of a growing “green conservative” movement. In the United States, green conservatives are adding to the ruptures in the Republican Party. There is even a branch of the Christian Coalition, that is splintering because it too supports the idea of green values because it sees green as supporting family values, helping the poor and the idea of stewardship. We see lots of green conservatives here in northwest BC among the hunters, fishers and fishing guides and those who work in the industrial sector who like hunting, fishing, hiking and boating. Did they vote for the NDP or the Liberals? Usually the sample size in northwest BC is too small, but drilling down might indicate that there were enough green conservatives who voted for what should now be called the Orange Coast. If Adrian Dix and the NDP had campaigned effectively with an eye on the green conservatives, there might actually be an NDP majority. If Christy Clark actually keeps her hints of a possible tilt toward green conservatism and moves away from the free enterprise at any cost faction of the Liberals (including that 801 coalition that died at 802), she might actually be in for a long run as BC premier. If, on the other hand, as the Globe and Mail advocates this morning, if Clark does move, bowing to Alberta’s demands, toward more unfettered development, as environmentalists fear and the aging free entrerprisers would love, the next provincial election will be one to watch, perhaps with the Greens filling a vacuum created by the Liberals and the NDP. As for the pollsters, there have been two major failures in Canada, the BC and Alberta elections. The pollsters were wrong about the Israeli election as well, which means polling failure is not confined to Canadian politics. It’s time for the pollsters to stand down, go back to the beginning, and take a look at all their practices, including the basic questions they are asking and to wonder if the questions reflect an unconscious bias in favour of the party paying for the poll (good professional pollsters do usually try to avoid open bias question sequences). If the polling companies don’t change, they too will soon follow the dying mainstream media into oblivion, so neither will be around to see a possible future where the concerns for the environment are a given and the debate is over the real solution to stave off catastrophe. This post has been updated to clarify that those who I call Conservative cheerleaders failed to be clear about the energy industry, not the overall campaign. 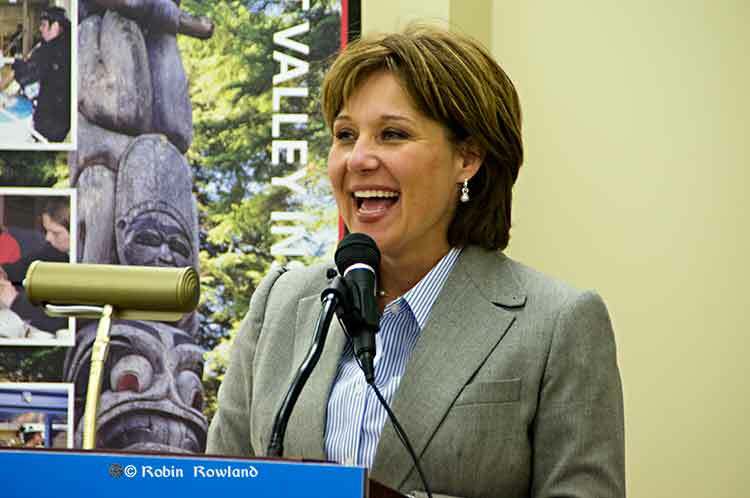 Premier Christy Clark announced her controversial five conditions for pipeline development in BC in July 2012. Clark’s announcement was aimed both at the Northern Gateway Pipeline which would have its terminal in Kitimat, and the proposed Kinder Morgan pipeline expansion which has its terminal in Vancouver. It is not clear how long the web page has been up, but the call for input from the public has received little, if any, publicity. The deadline for public submissions is February 15, 2013. 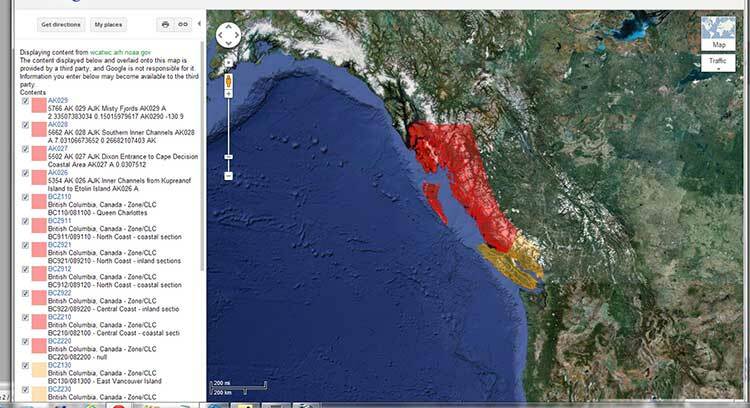 As part of British Columbia’s commitment to a world leading preparedness and response regime for land based spills, it is hosting a symposium March 25-27, 2013 in Vancouver, BC. Due to the anticipated high interest in the symposium, attendance is by invitation only. In keeping with the established polluter-pay principle, and recognizing the increase in development activities across the province, the Ministry of Environment (the ministry) is reviewing industry funded options for strengthening BC’s spill preparedness and response policies and capacity. Land based spill refers to any spill impacting the terrestrial environment, including coastal shorelines, regardless of the source. 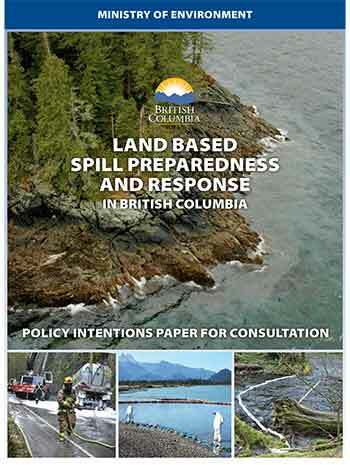 Effective government oversight and coordination of industry spill response The ministry has developed a policy intentions paper for consultation (intentions paper) on the three aspects of the province’s land based spill preparedness and response regime under consideration. 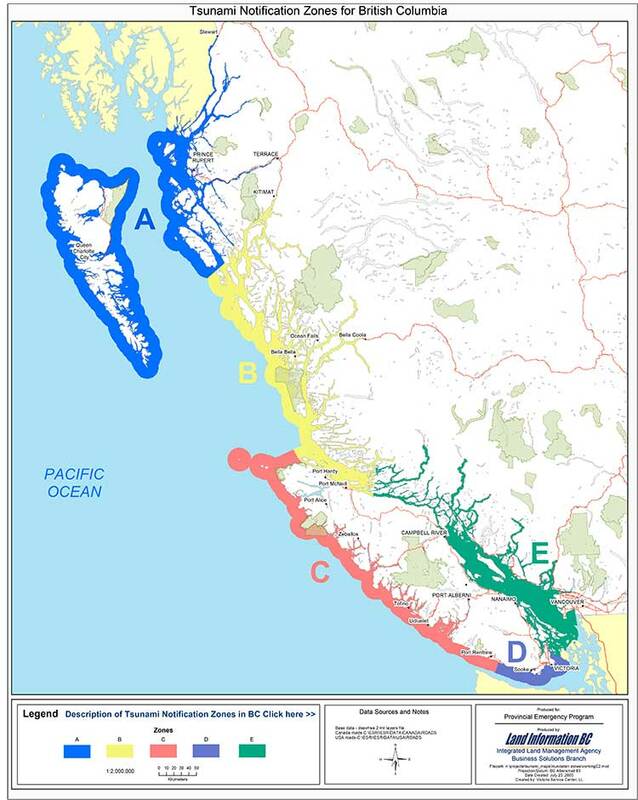 The purpose of this intentions paper is to describe the ministry’s proposed policy direction and seek input on enhancing spill preparedness and response in BC. The intentions paper is a discussion document and your feedback will influence the policy approach. Although the call for input is on the ministry website, the contact is a management consulting firm C. Rankin & Associates.